Ask any Jeep owner and they'll be familiar with Rugged Ridge's products. Built exclusively for Jeeps in mind, every single one of Rugged Ridge's parts and accessories have a purpose and reason. From extreme off-roading to everyday driving, Rugged Ridge is guaranteed to have a part available that you need. The accessory that has the power to turn your vehicle into something more rugged and stylish. At the same time, it provides another layer of grille protection that you can highly benefit from. Meant to withstand off-road conditions, this is a worthy addition that you will not regret at all! 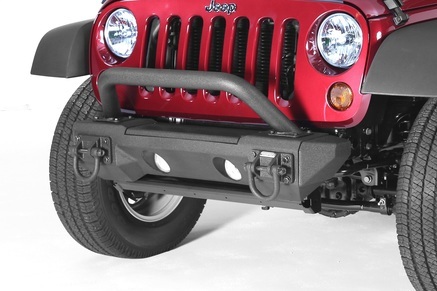 A bumper that will protect your vehicle but at the same time, will not cost you an arm and a leg. This will keep you protected at all times even when you go off-road! It is very to install. In fact, you can do the installation all on your own! 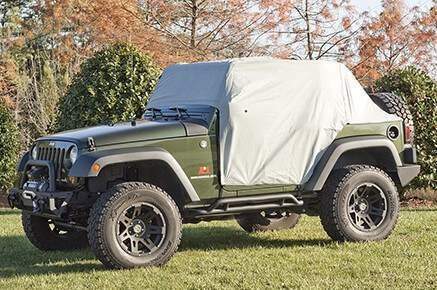 Rugged Ridge Cab Car Covers are designed to project the cab area of your Jeep if you prefer to leave the original equipment top off. They are available in vinyl or a heavier duty three layer weather lite material. The covers easily strap into place to prevent damage to interior components caused by sun, rain, or other elements. The lighter vinyl cover is recommended for inside storage applications to keep dust from accumulating in the cab. The heavier weather lite option is recommended for short-term outside use. 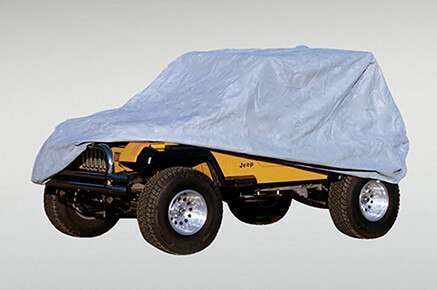 Rugged Ridge Full Car Cover is designed to protect the entire Jeep from the elements; not just the cab area. They are constructed utilizing a three layer composite material to facilitate water resistance by repelling the water on contact. They are ideal for long-term inside storage or short-term outside storage keeping your Jeep clean, dry, and looking like new. The installation process is quick and easy and tie down straps are incorporated to hold the cover in place. 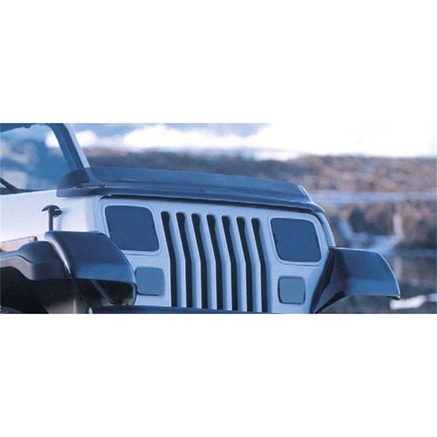 Rugged Ridge Body Armor Hood Stone Guards are designed to protect painted hood surfaces and windshields from damage caused by debris during on and off road adventures. The black diamond plate design represents a very rugged appearance creating a unique off-road orientated accent. The durable construction deflects stones, rocks, and other debris with ease protecting the hood and windshield. The installation process does require some simple basic drilling to secure this component appropriately and provide a higher durability level. 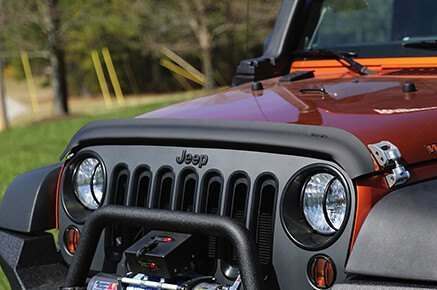 Rugged Ridge Classic Bug Deflectors incorporate a classic and rugged matte black design that accents the overall representation of the vehicle. They are constructed utilizing a durable acrylic material that in molded to the specific contour of the hood with a smooth sleek finish. 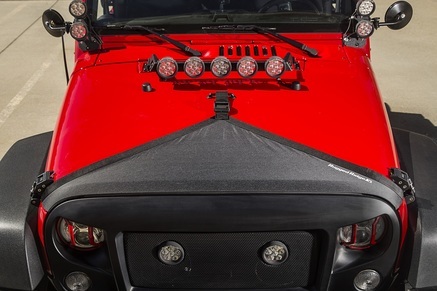 The deflector provides a high level of protection to the painted surfaces of the hood and the windshield by deflecting bugs and other debris during on and off-road adventures. The installation is simple and all of the necessary hardware is included. Rugged Ridge Side Window Visors allow fresh air to circulate throughout the cabin and block the elements such as sun and light rain from entering. The sleek vehicle specific design enhances the overall appearance of the SUV. The durable acrylic material is UV resistant and withstands the elements maintaining a long lasting like new appearance. The installation process is quick and easy with no tools required due to the 3M adhesive application process that is incorporated. Keep your windshield and hood protected at all times from harmful road elements with this bug deflector. Its matte black finish provides a boost in style while its construction guarantees toughness to last for years. You can easily install this in 2 ways. A worthy addition to your vehicle that you will not regret. Your hood needs tough protection as it is the first thing to go into road battle against road debris and other harmful elements. Thanks to this hood bra, you can guarantee ultimate protection while it keeps your paint job cushioned and secured. It is very easy to install, letting you have it ready in no time! A great addition to your vehicle to make it look even more rugged, this fender flare isn't just for show. It offers coverage that will protect your vehicle's bodywork. The paint is also customizable, which means that you can have it painted to match your paintwork. Easy installation is the cherry on top of this worthy addition. 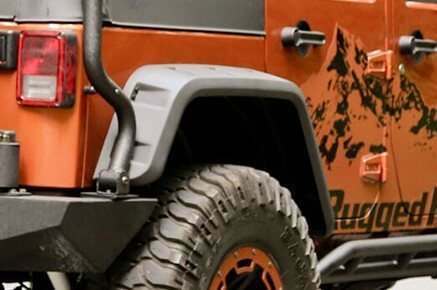 Rugged Ridge All Terrain Fender Flares are designed to protect fenders, rocker panels, and door panels from damage caused by rocks, stones and other debris. 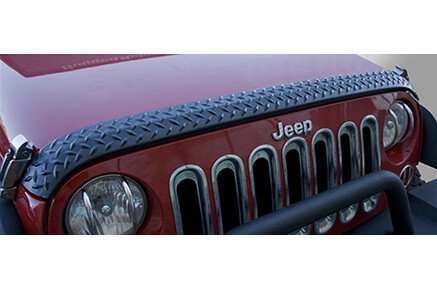 The durable ABS construction establishes a rugged and aggressive appearance that enhances the overall representation of your Jeep. They are application and vehicle specific to facilitate the installation process and ensure an exact fit. The flares are backed by a five year warranty. 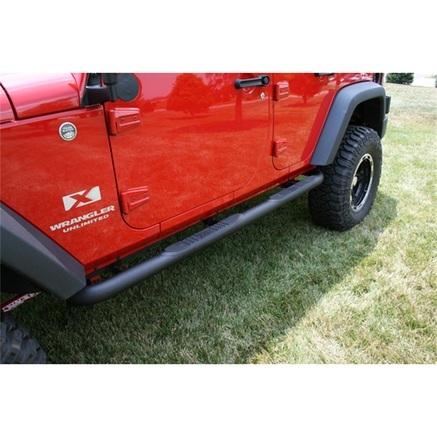 Rugged Ridge Hurricane Fender Flares incorporate a unique high-profile design that expands the fender well area of a Jeep Wrangler to the maximum height possible. 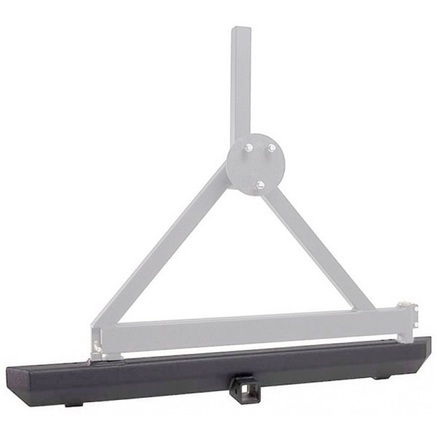 They are constructed utilizing durable molded automotive grade plastic and are application specific. The unique design facilitates the installation of extremely large all-terrain tires by providing ample clearance. Side marker lights are incorporated to enhance the overall appearance and illuminate the extended flare. The installation hardware includes both chrome and black rivets that allows you to select your preference. 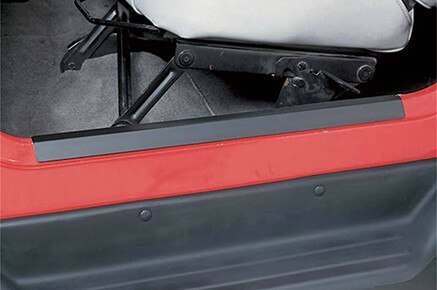 Rugged Ridge Body Armor Rocker Guards are constructed utilizing durable materials to protect painted surfaces such as rocker panels and lower door panels. 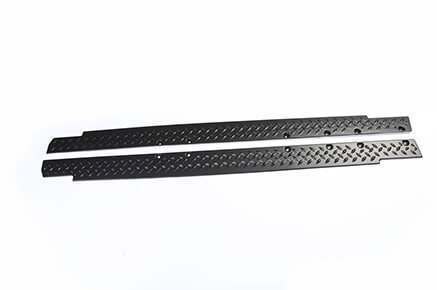 They incorporate a classic black diamond plate design to create a rugged appearance and enhance the overall representation of your 4WD vehicle. 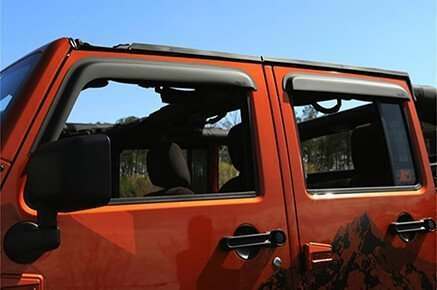 They protect the panels from damage that can be caused by rocks, stones, and debris during off road adventures and normal daily driving as well. The guards are vehicle and application specific to ensure an exact fit. 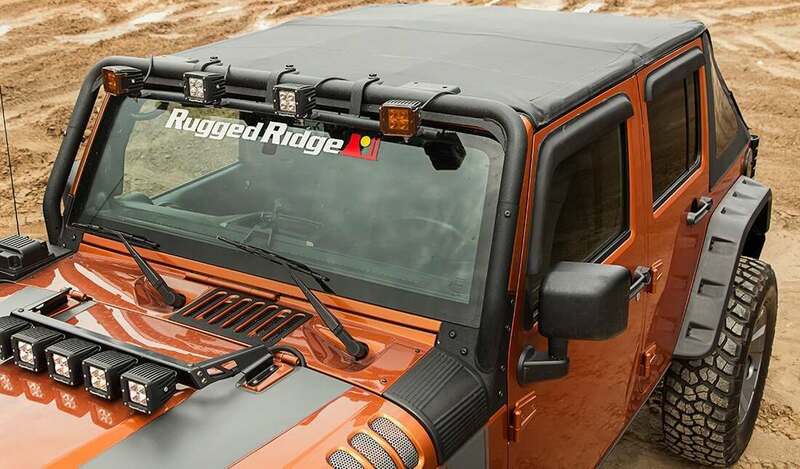 Rugged Ridge Side Nerf Bars offer a unique off-road appearance and protect side body panels during off-road adventures. The durable steel tubing construction provides a sturdy stepping surface that extends beyond the body panels of the vehicle. Non-slip step pads are incorporated to accommodate sure footing while entering and exiting during muddy or adverse weather conditions. The vehicle specific application facilitates the easy installation process by bolting to existing holes in the frame with no drilling required. All of the required hardware is included. 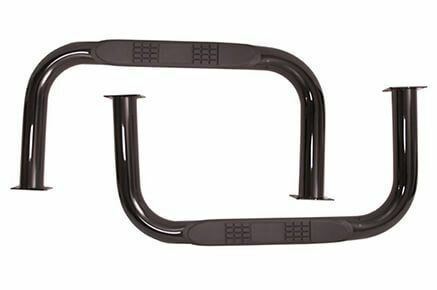 If you are looking for something to add to your Jeep that is practical, this is a great choice for you. Who doesn't need side steps, anyway? Providing you with easier access to your Jeep and at the same time, boosting your Jeep's safety. And to top all that, it delivers style. 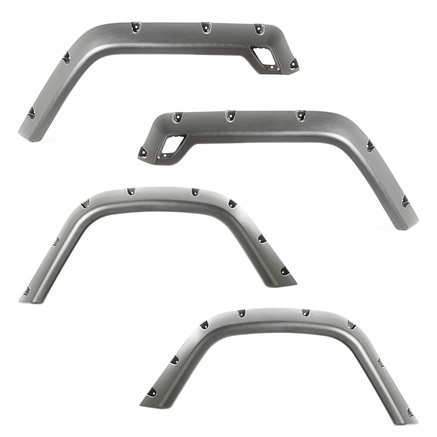 Rugged Ridge Door Sill Entry Guards are constructed from durable materials to protect painted door sill surfaces and resist scratches, clips, and other damage. The unique vehicle specific design enhances the overall representation of the vehicles entry points. Stainless steel, aluminum, and black options are available to create the custom appearance you prefer and coordinate with existing accents. The installation process is quick and easy with no drilling is required due to the adhesive application that is incorporated. Rugged Ridge is a brand of Omix-Ada, the world's largest Jeep parts independent manufacturer. With thousands of parts available for Jeeps, Rugged Ridge is bound to have the exact part you need for your Jeep Wrangler, CJ, or Cherokee. 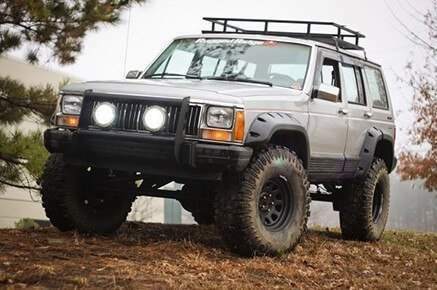 Combined with Omix-Ada, there are over 15,000 different restoration and replacement parts available for Jeeps. PartCatalog.com is a proud retailer for Rugged Ridge. For more information on Rugged Ridge, please visit the Rugged Ridge official website.